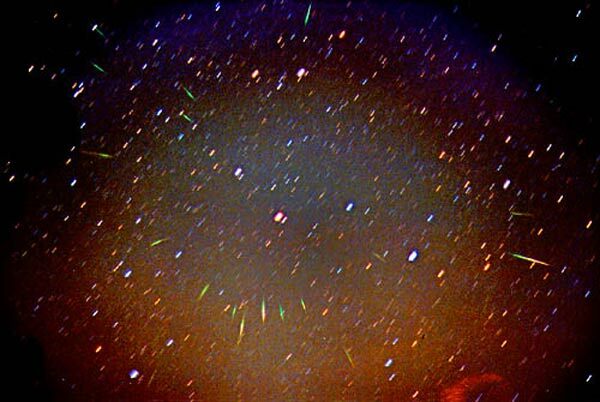 Opis: The 1999 Leonids meteor shower was not equally good for everybody. Only observers in Europe and the Middle East with clear skies near 2 am (UTC) on 1999 November 18 saw rates shoot up to a meteor every few seconds. Above, however, is a picture taken from Spain during this time, with over a dozen faint meteors visible as green streaks eminating from Leo during just a six minute exposure. Although more numerous, the 1999 Leonids did not have the same high proportion of bright meteors and fireballs as the 1998 Leonids. Last year's Leonid fireballs have been traced back to the 1333 passage of Comet Tempel-Tuttle. The orbit of Jupiter continually deflected one stream of cast-off particles while the smallest meteors in this stream were removed by light pressure from the Sun. The remaining Leonids were relatively large, pea sized or larger, compared to the sand-sized Leonids that are more common.